← 2014 Summer Movies in the Park: Mark your Calendars! 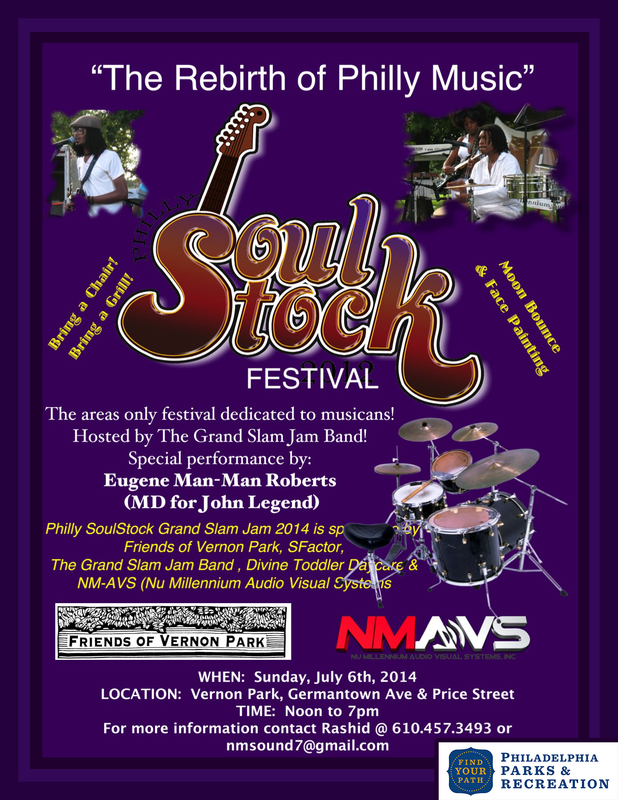 Philly SoulStock Festival 2014: July 6//Free & Family Friendly! Friends & Neighbors, Join us for a very special, free & family friendly, live music event on Sunday, July 6, 2014! THE REBIRTH OF PHILLY MUSIC! Philly SoulStock Grand Slam Festival 2014 is an annual ‘Musicians’ festival featuring Musicians from the old to the new all on one stage playing all genres of Music. This event is a partnership of musical forces between The Grand Slam Jam, a elite musicians shed held every Wednesday in Philadelphia, hosted by Stanley P. Brisbon, Brett Jolly, Sideby Sol. The festival will also feature the areas most polished vocalist and spoken word lyricist. Sound, Staging & backline will be provided by Nu Millennium Audio Visual Systems. Also, there will be a Moon Bounce, Face Painting & more! LOCATION : Vernon Park, Germantown & Price Street, Phila, PA 19144. This event is sponsored by Friends of Vernon Park, The Grand Slam Jam Band, S-Factor, NM-AVS and Divine Toddler Daycare.